For those of you fortunate enough to attend our 7th annual Single Malt Christmas Party this past Monday, I am sure each of you will agree that it was an outstanding success. Our hosts, Peggy Johnson and Mel Hutson did a fantastic job and I am sure each who were present will all join me in thanking them for making this party a pleasure to be at - many, many thanks Peg and Mel. There was also a wonderful array of delicious food which we all tucked into - and to all who contributed, thanks for making your selections so festive. Last and certainly not least, was the wonderful selection of single malts that were there for each of us to sample and enjoy - the selection from all the geographic areas of Scotland certainly had something for everyones palate. I use the term Ladies (as seen above), because we were so fortunate having our dear ones present on this occasion. Several of these ladies, like us gentlemen, do enjoy partaking in having a dram or two of 'The Water of Life'. Here's wishing each of you, a very Merry Christmas and a Happy New Year. The four people in question were David Orr, Larry Recknagel, Larry Riley and yours truly. Sadly Larry Recknagel passed away a few years ago, but it was he that suggested that we gather at one another’s homes and share each other’s single malts, discussing and analyzing the pros and cons of the various single malts as we sampled them – Larry by the way was a member of The Scotch Malt Whisky Society and had several bottles of cask strength whisky which he readily shared. So an idea was born – a couple of months later the first gathering was held at the house of yours truly, along with several other gentlemen on the mountain who we found out, shared this same passion as ourselves. On May 28th 2007 was when it all started, and as the months and years passed by, more and more like-minded aficionados were added to my email list. I find that our email list, and emailing to everyone on it, is a very important factor in keeping the interest in single malt whisky alive – not only is everyone kept abreast as to who is hosting each month etc., but any articles found relevant to single malt whisky, are circulated too. People on this list are also culled – that’s if they do not attend any gatherings within a twelve-month period. At different times we have had single malt whisky suppliers (Ben Arnold, Gordon & McPhail, Glenlivet) bring their wares and talk about their products. Each year a member hosts our annual Christmas Party, where our wives are also invited to join – as far as the food is concerned we always try to keep a Scottish flavour present, where Scottish salmon, Scottish deviled eggs, Shepherds pie, and Dalwhinnie bread & butter pudding, to name a few, are on the menu. Only on two occasions did gentlemen bring along a whisky blend to one of our gatherings - naturally the gentlemen in question were roasted and embarrassed to such a degree, that such an oversight never happened again. Although one of the gentlemen blamed his wife for purchasing the wrong whisky – bah humbug! I am also happy to say, that since our inception, our local supplier of single malt whisky in Landrum, who has worked very closely with us, has increased his stocked range of single malts by at least 68%. Another section of our website you will probably find very interesting is entitled, ‘My Mentor’s Notes’. A very close friend, who got my taste buds going in the right direction, actually sampled, appraised and categorized the single malts of over 100 distilleries. Living just outside of Edinburgh he was able to buy miniatures of everything that these distilleries produced. 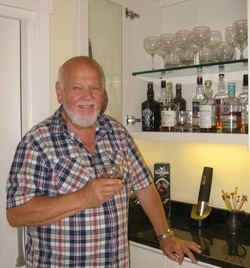 By clicking on http://www.glassysinglemalt.com/Single_Malt/9.html you will see his hand written notes describing his thoughts, positive or not so positive, on all the single malts he sampled. It was from these hand written notes, that for the past 30 years I have been able to make some informed decisions on the single malts I purchase, consume and ultimately enjoy.